Council of State Governments Executive Director and CEO David Atkins recognized Rep. Ryan Mackenzie at a ceremony that marked Mackenzie’s completion of the 2014 Henry Toll Fellowship program. 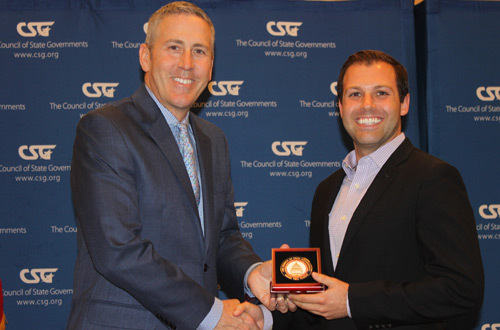 HARRISBURG – Rep. Ryan Mackenzie (R-Berks/Lehigh) recently completed the Council of State Governments (CSG) Henry Toll Fellowship program. Mackenzie was one of only 48 state policymakers from across the country invited to participate. A nine-member committee of state leaders, many who are Toll Fellows themselves, reviewed a record number of applications to select this year’s participants. Mackenzie was chosen largely because of the major impacts he has in the Legislature in the areas of tax policy, job creation and education – a record organizers found impressive considering his short tenure thus far in the General Assembly. “The Henry Toll Fellowship has a distinguished history of cultivating some of the nation's top leaders and forging lasting relationships among a special few who serve without fear or favor,” said Tennessee Senate Majority Leader Mark Norris, the 2014 CSG national chair and a 2002 CSG Toll Fellow. For more information, please visit www.RepMackenzie.com or www.csg.org.